It’s not difficult to protect your company’s intellectual property (“IP”) and build a valuable IP portfolio. It doesn’t require you to become an expert, or work extra hours on weekends. It’s actually fairly easy when you have an efficient, systematic, and well-executed plan. The hard part is knowing what that plan should be in the first place. If you don’t know where to start, or you’re not sure whether you’re doing enough, you’re certainly not alone. Given the maze of available strategies, outdated information, and byzantine laws, it’s a wonder anyone is successfully protecting their IP assets without a massive legal department. In this series of blog posts, we’re going to destroy the confusion and complexity and make everything as straightforward as possible. Let’s begin with an overview of IP in general. Intellectual property is often defined as “property that derives from the work of the mind or intellect.” This seems oddly unhelpful. It might be easier to think of your IP as the intangible parts of your business – the nonphysical stuff that you wouldn’t want someone to use without paying. For example: your brand name and the good will you have with your customers, the written and visual materials that reflect your creativity, the unique designs and functionality of your company’s products, etc. Different attorneys may specialize in different areas of IP – meaning, for example, that some attorneys prepare and handle patent applications, while other attorneys deal mainly with trademark litigation. We’ll talk briefly about each of these major areas, with the understanding that other legal considerations, such as certain areas of privacy and the right of publicity, overlap with IP law. We can put those aside for now, though, because they’re more about individual rights, and our concern is how all of this affects your business. Let’s start at the top and go down each branch, taking things from left to right. If we’re trying to protect something like your product’s name, your logo, or a tag line, we’re dealing with branding issues. The question to ask is this: Does the word, name, logo, etc. help customers identify that YOUR COMPANY is the source of the goods and services, rather than someone else? If so, Trademark law will help protect your branding against those who might, intentionally or otherwise, confuse your customers by using something similar. Okay, but what about protecting your actual products? How do we stop others from copying those? Generally speaking, there are two areas of the law that provide protection in this area: Patent Law and Copyright Law. 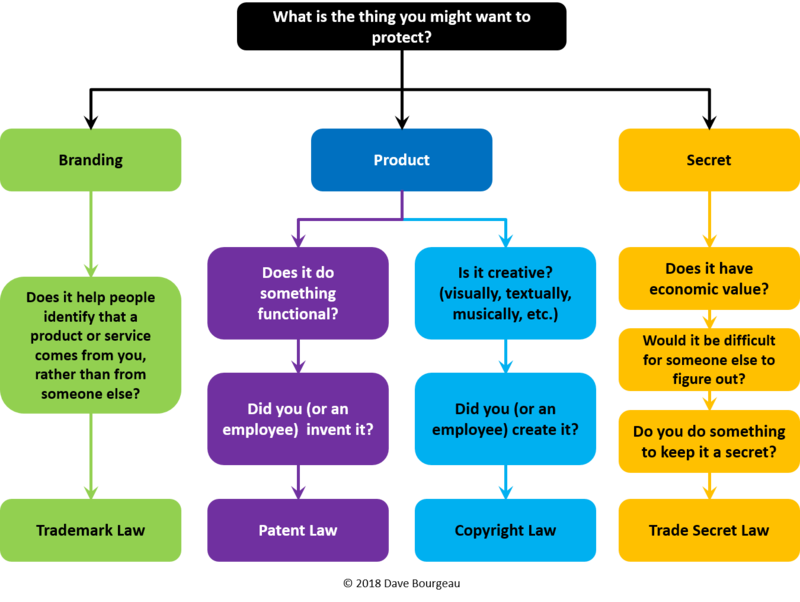 They overlap a bit, but here’s a good way to think about it: patents protect how something works, copyrights protect how something looks or sounds (i.e., seeing, reading, hearing). So, the first thing to ask about your product is whether it’s functional. In other words, does it “do” something or “work” in a certain way? If that’s the case, and someone at your company came up with the idea (i.e., invented it), then Patent Law applies. This doesn’t mean you can necessarily get a patent. However, it does mean that you should probably speak with a patent attorney. Unlike the other areas of IP law, patent attorneys must be registered with the U.S. Patent and Trademark Office. That means the lawyer must have a technical or scientific undergraduate degree, pass a special examination, and be certified before they can prepare patent applications and help you with the patent examination process. Currently, only about 2.5% of all lawyers are qualified as patent attorneys. The next thing you should ask about your product is whether it’s creative in any way, meaning it has some aspects of visual design, written text, recorded music or speech, particular arrangement of information, etc. If so, and someone working for your company created it, then Copyright Law applies. Copyright Law tends to have sub-categories, because it deals with many different topics. For example, companies who work with musicians and composers will often have different concerns and legal issues than software companies or book publishers. Even if your company doesn’t make or handle a product that directly deals with copyright law, almost every business will have some sort of copyright issue to deal with – whether it’s a user manual, website design, product photography, or software license. Finally, consider the valuable secrets of your business – business information that gives your company an economic advantage precisely because it’s not known by other companies. 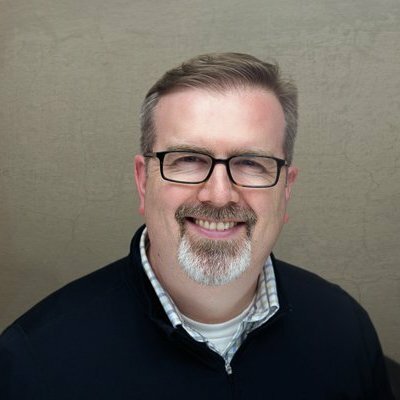 This includes things like secret formulas, customer lists, and manufacturing processes. As long as you are taking real measures to keep these things secret, and they aren’t easy for someone else to figure out (e.g., by reverse engineering), Trade Secret Law will assist you in preventing the theft of your trade secrets. That’s it for now. Hopefully, you have a better idea what IP is and how it might apply to your business. In the next post, we’ll talk about why you should protect your company’s IP. Until then, keep up the good work!